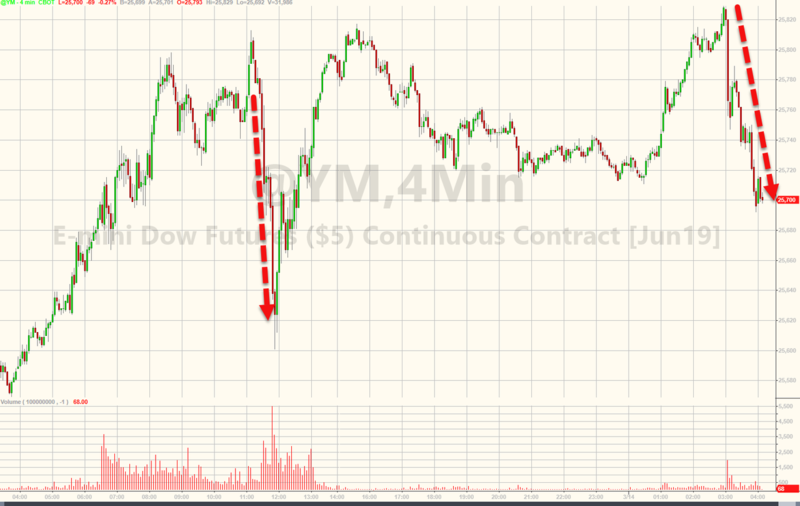 With S&P futures trading at session highs, at precisely 6am EDT the Eminis tumbled, rapidly approaching session lows following a Bloomberg report that trade negotiations may not be going quite as well as represented, as a meeting between President Donald Trump and President Xi Jinping to sign an agreement to end the ongoing US-China trade war won’t occur this month and is more likely to happen in April at the earliest. The market reaction is shown below. As Bloomberg adds, despite repeated claims of progress in talks by both sides, a hoped-for summit at Trump’s Mar-a-Lago resort will now take place at the end of April "if it happens at all." China is pressing for a formal state visit rather than a lower-key appearance just to sign a trade deal, the person said. Confirming prior reports, a Bloomberg source said that Xi Jinping’s staff have scrapped planning for a potential flight to the U.S. following a trip to Europe later this month. The hints that not all is well were there, even if the market chose to ignore them: earlier this week, U.S. Trade Representative Robert Lighthizer pointed to “major issues” still unresolved in the talks, with few signs of a breakthrough on the most difficult subjects including treatment of intellectual property. Chinese officials have also prickled at the appearance of the deal being one-sided, and are wary of the risk of Trump walking away even if Xi were to travel to the U.S.
Trump himself has shifted tone in recent days, walking back from a more urgent approach to getting a deal signed as early as March. He acknowledged concerns in Beijing about the possibility of him walking away from a trade deal, offering to push back a summit with Xi until a final deal is reached. Considering that much of the 500 or so S&P point rally from December 24 has been built on market "optimism" that a US-China deal is now a done deal, any potential failure to secure an outcome that has already been priced in risks sending the S&P sharply lower, and certainly once again below 2,800 a level which algos just seem powerless to break out decisively above.